The ME 4 clip-on cardioid microphone compliments this ENG set by blocking out extraneous background noise due to its high-directivity. 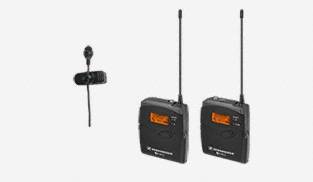 The Sennheiser EW 122-P G3 bodypack transmitter and portable adaptive diversity receiver are equipped with charging contacts built-in to the housing for use with Sennheiser's optional rechargeable batteries. Reception stays strong as the receiver is upgraded to utilize its line cable as a second antenna for adaptive-diversity operation.